In difesa della Natura. Installation, objects, photography and video (1972-1985). Co-curated by Fondazione Bonotto. Joseph Beuys (1921 –1986) was a German Fluxus, happening and performance artist as well as a sculptor, installation artist, graphic artist, art theorist and pedagogue of art. His extensive ouvre is grounded in concepts of humanism, social philosophy and anthroposophy; it culminates in the idea of social sculpture as a Gesamtkunstwerk, for which he claimed a creative, participatory role in shaping society and politics. 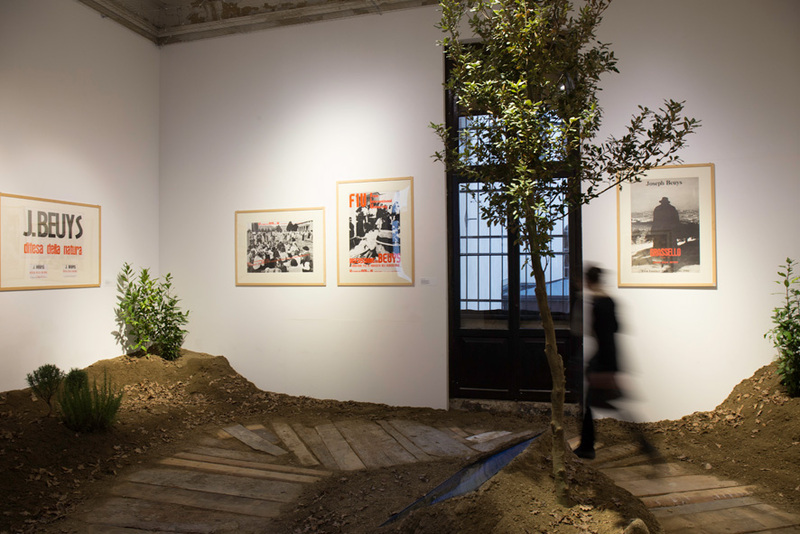 The VENICE INTERNATIONAL PERFORMANCE ART WEEK 2014 shows In difesa della Natura, one of the most important actions carried out by the German artist during the last fifteen years of his life. An operation that placed at the centre of attention Nature, agriculture and its sustainable development in anticipation of themes, which have been so widely discussed in the recent years and which will be the focus of the Expo Milano 2015 Feeding the Planet, Energy for Life. The homage, organized by FONDAZIONE BONOTTO in collaboration with Lucrezia De Domizio Durini, rebuilds a part of the Abruzzo countryside where the visitors can walk among the Beuysian trees (Olive, Oak, Laurel and Rosemary) and immerse themselves in a highly evocative atmosphere due to the presence of some objects and historic manifestos used during the actions, as well as the extensive photographic documentation by Buby Durini. To complement and support this exhibition selected videos by Beuys are presented. Curated by Fondazione Bonotto in collaboration with Lucrezia De Domizio Durini. + READ "Who is Joseph Beuys? ", Essay by Lucrezia De Domizio Durini | LEGGI "Chi è Joseph Beuys? ", testo di Lucrezia De Domizio Durini.